Rabindranath Tagore’s influence on Indian culture and cinema hasn’t ceased even years into his afterlife. Junglee home video’s latest release Kashmakash directed by 8 time National Award winner Rituparno Ghosh and produced by Subhash Ghai is a tribute to the legendary writer on his 150th anniversary. 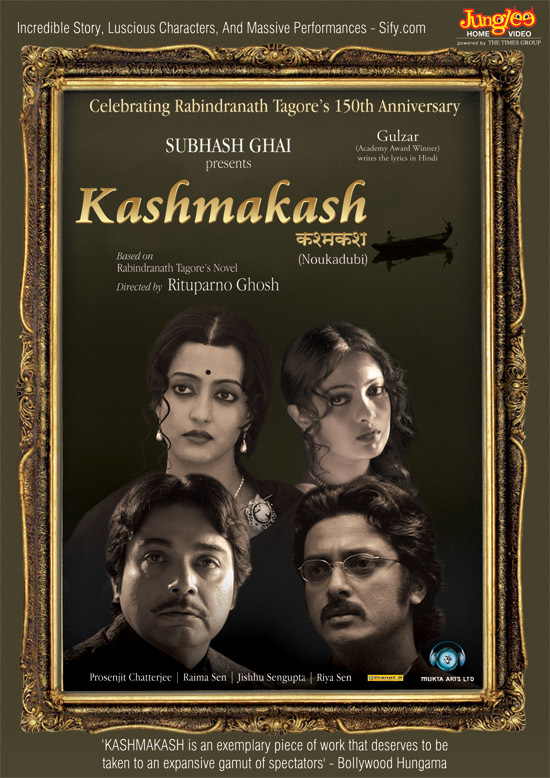 Kashmakash is the Hindi dub of this period film set in the 1920’s based on a short story by Tagore with a wonderfully intricate plot about a love that is put to the test by tradition and deceit The Bengali to Hindi translation of the songs has been done by Gulzar and film stars Prosenjit Chatterjee, Jisshu Sengupta, Raima Sen, Riya Sen. So add a shot of love to your weekend with this classic tale from Tagore that is available on DVD across all major music & retail outlets.